The 3.7 billion people who make up the poorest half of the world saw no increase in their wealth last year. Here’s something we’re rarely told growing up: our world rewards wealth, not hard work or talent. It would pain me to tell our young girls and boys that they are already losing. The injustice of it would be too ugly and too hard to explain. But that’s the world that we have built. A world where 82% of the wealth created last year went to the richest 1% of the population. Meanwhile, the 3.7 billion people who make up the poorest half of the world saw no increase in their wealth last year. Nothing. Zero. Corporations are driving down wages and working conditions across the globe to maximize returns for their shareholders. They use their power and influence to ensure the rules align with their interests – no matter the cost. Many of our governments don’t just let this happen, they actively facilitate it. In a frenzied drive for GDP growth, they slash corporate taxes and strip away the rights and protections of workers. The result? Women in hot, overcrowded garment factories in Bangladesh paid poverty wages to stitch clothes for us to buy cheaply. Hotel housekeepers cleaning luxury rooms afraid to report sexual harassment for fear of losing their jobs. Poultry workers in the US - the richest country in the world – forced to wear nappies because they are denied toilet breaks. But in boardrooms, far removed from this suffering and indignity, things are better than ever. Shareholders and corporate bosses are enjoying record profits. The world’s political and business elites are meeting in Davos, Switzerland, for four days this week. In that span of time, the world’s billionaires will see their fortunes swell by an estimated $8 billion. Breaking it down another way. While nine out of every 10 billionaires is a man, it is women who are most often found in the poorest paid and least secure jobs. That’s the reality of “prosperity” in our world today. It’s built on the backs of workers around the world. We don’t want to tell young girls and boys that the odds are stacked against them from the start. Instead, we could tell them that with passion, conviction, and determination we can build a better future. 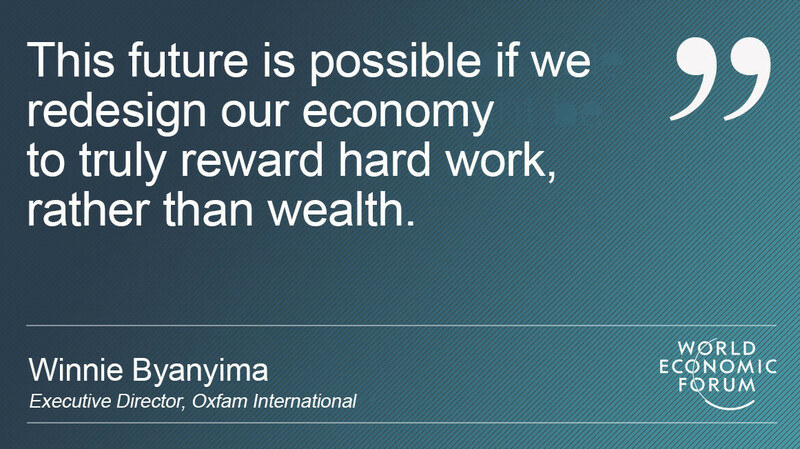 This future is possible by redesigning our economy to truly reward hard work, rather than wealth. 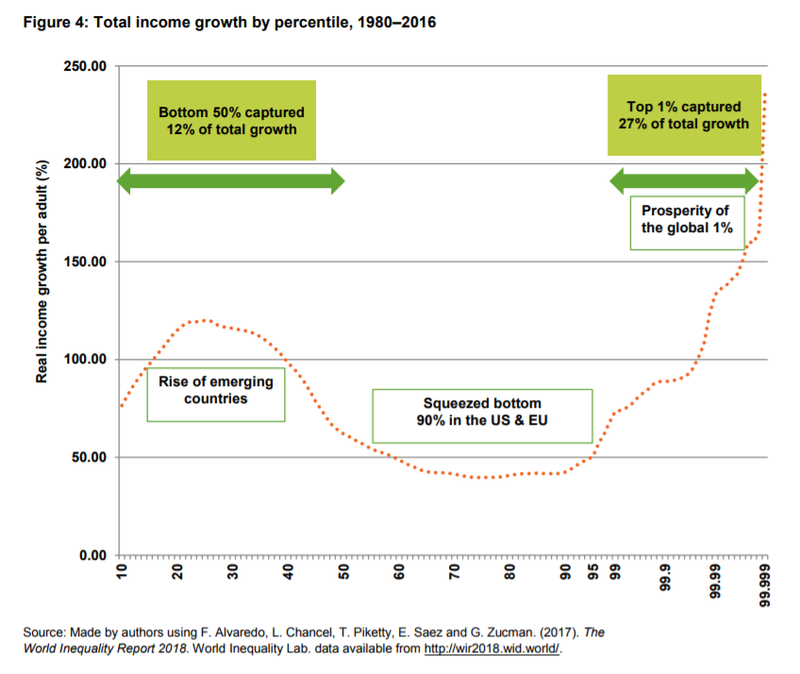 The World Inequality Report published last month by the World Inequality Lab at the Paris School of Economics proves government action can significantly reduce inequality. Forward-thinking politicians around the globe are already showing what is possible. Just a few weeks ago, Iceland introduced a law making it illegal for firms to pay women less than men as part of government plans to eradicate the gender wage gap by 2020. In 2010 Ecuador introduced a minimum ‘dignity wage’ that covers the basic costs of living. This has benefited hundreds of thousands of workers and debunked the myth that there is a trade-off between decent wages and jobs. Ecuador has one of the lowest unemployment rates in Latin America. Meanwhile, South Africa has introduced progressive tax policies to raise funds to expand public services such as healthcare and education. In the UK, we have seen examples of how governments can ensure workers’ rights are protected in the technological revolution when a court ruled that drivers working for the taxi-hailing app Uber are employees – not self-employed – and must be entitled to holiday pay, paid rest breaks and the national minimum wage. These examples, among others, show there is no shortage of solutions. What is lacking is political will to put these into action. We also need business leaders who see the benefits of a well-paid workforce and a well-functioning society. Decades ago, Henry Ford recognized that the long-term health of his businesses was best served by paying his workers enough to afford the cars they built. At the World Economic Forum Annual Meeting 2018, I will be urging political leaders to limit rewards to shareholders and senior executives, introduce a statutory living wage, build fairer tax systems, invest in healthcare and education, and shepherd in a technological revolution that works for all. I will be calling on business leaders to stop paying huge share dividends and awarding bumper pay packages to top executives until they can guarantee that all of their workers are getting a living wage and that their suppliers in their supply chains are being paid fair prices. I’m sure every political and business leader I speak to in Davos will echo my concerns about the inequality crisis. But I, like hundreds of millions of people, am growing impatient waiting for them to act.